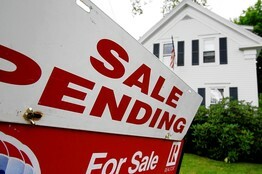 August 8th, 2011 8:31 AM by Lehel S.
The Wall Street Journal's latest quarterly survey of housing-market conditions in 28 major metropolitan markets found inventory levels were down in all but three markets and were down by double digits in 16 markets in the second quarter, compared with a year ago. Listings in Miami were down 43% from a year ago and were off 30% in Washington, D.C. Several cities, including Charlotte, N.C.; Seattle; and San Francisco, saw declines greater than 20%, according to figures compiled by John Burns Real Estate Consulting. A decline in the number of homes for sale has raised hopes the market is improving. Above, a house coming off the market in Bath, Maine. "We're in a shortage situation," said Brett Barry, a real-estate agent in Phoenix. "It's a very artificial, 'Twilight Zone' kind of feeling, because we know there's a lot of homes out there." If supply remains constrained, prices could stabilize. "We're not at the end of the housing nightmare, but we seem to be getting closer," said Jeffrey Otteau, president of Otteau Valuation Group, an East Brunswick, N.J., appraisal firm. But if banks accelerate foreclosures, inventories will swell again. Mr. Otteau says it is too soon to celebrate because "we are all expecting that foreclosure 'tidal wave' to begin sometime soon." Another factor behind falling inventory levels is shifting behavior on the part of sellers, who in recent months have started to yank homes off the market because they couldn't get a high enough offer. "Sellers think they'll get a better price if they wait and sell it next year, and I just didn't hear that from sellers two years ago," said Glenn Kelman, chief executive of Redfin Corp., a Seattle-based real-estate brokerage that does business in 13 states. Consider the case of attorney Natasha Gonzalez Rojas. After landing a job in Dallas last summer, Ms. Gonzalez Rojas tried unsuccessfully to sell a three-bedroom condo in Philadelphia for $499,000. She and her husband rented it out and in June discussed renewing their tenants' lease for another year. They lose about $1,000 every month but don't want to sell for less than what they owe. "We're not willing to pay somebody to buy our house," Ms. Gonzalez Rojas said. Until they sell their Philadelphia home, they are also unlikely to buy a home in Dallas. "We don't want to have two mortgages, and I doubt we'd even qualify," she said. Shannon Keyes Woodward, 29, and her husband are ready to move out of a "ludicrously priced" rental apartment in Alexandria, Va., but have been outbid on every property on which they have made an offer. "It's devastating, not being able to find anything," said Ms. Keyes Woodward. Despite the possible downsides of emergency repairs, careless tenants or periods of vacancy, "with the returns as high as they are, there's a lot of room for error," Mr. Chan said. "Any way you look at it, it's just an incredible deal."